:: Buzzwords Archive: November 2017. Click here for the latest posts. A literary event celebrating of the visual, visceral, messy, handwritten and colourful in poetry with new unique commissions from writers exploring alternate ways of making literature. Each presentation will be different from the last, with readings, performances and talks alongside pop up exhibits, interactions, video poems and more. Featuring new works from Harry Man, Imogen Reid, Stephen Emmerson, Hiromi Suzuki, Paul Hawkins, Chloe Spicer, Kate Wakeling, Christian Patracchini, Patrick Cosgrove and Christopher Stephenson. These works will explore the possibilities of literature and liveness, responding to the page and to the act of writing itself. Commissions include explorations of erasure and lettering, dyslexia, dyspraxia, and poetry, video poems, gif poems, passive reading, children’s languages, abstract illustration and more. Poem Brut is an exploration of poetry and colour, handwriting, composition, abstraction, scribbling, and illustration, affirming the possibilities of the page, the pen, the pencil – in a computer age – generating over a dozen events, multiple exhibitions, workshops, conferences and publications. Our first event will be followed by an exhibition – ‘Hard to Read’ – also at the Rich Mix, opening December 9th. 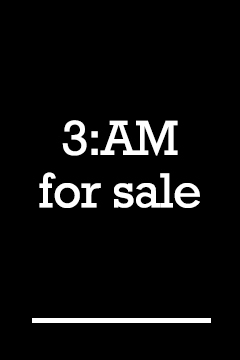 3:AM Magazine, a partner in the project, is also running open call for new works that fit within the tradition. Join us for an exciting evening of readings by contemporary experimental authors from Equus Press, Minor Literature[s] & 3:AM Magazine on 11th November. Louis Armand – author of eight novels and ten collections of poetry, most recently The Combinations (2016) and East Broadway Rundown (2015). Daniela Cascella – her work is focused on sound, literature, and art, driven by a longstanding interest in the relationship between listening, reading, writing & translating. Lara Alonso Corona – a freelance writer of noir, sci-fi and literary fiction. London via Gijón. Juliet Jacques – author of a book on English avant-garde author Rayner Heppenstall for Dalkey Archive Press (2007), and a memoir entitled Trans (Verso Books, 2015). Richard Marshall – has been a contributing editor for the cultural magazine 3ammagazine.com since 2001. He has published Philosophy at 3:AM: Questions and Answers with 25 Top Philosophers (2014). Fernando Sdrigotti – a London-based Argentine writer and cultural critic. He is editor-in-chief of Minor Literature[s] and a contributing editor to Numéro Cinq and 3:AM Magazine. The highlight of the evening will be Daniela Cascella & Juliet Jacques launching Cascella’s brand-new book, Singed (Equus Press 2017). Entry free of charge. Everyone welcome. Blackwell’s Bookshop is delighted to host our annual Oxford University Press Philosophy Festival, which will be running from Thursday 16th November until Sunday 19th November. This year the festival includes a range of free events, featuring an evening to celebrate the publication of Clare Chambers latest publication ‘Against Marriage’, the insightful Very Short Introduction Speed-dating event and a whole weekend of talks and discussions. On Sunday 19th November at 11:30pm, Richard Marshall will be discussing his new book ‘Ethics at 3am‘. What do ethicists and moral philosophers really think about? What are the most pressing concerns in the discipline today? ‘Ethics at 3am‘ is a collection of interviews with a range of interesting and original thinkers in the field provides a snapshot of contemporary ethics in all its complexity and nuance. Richard Marshall has worked in secondary school state education in the UK since 1983. He has been a Head of English a head teacher, and an educational consultant. He holds as PhD in Philosophy of Education from the University of London and has been a contributing editor for the cultural magazine 3ammagazine.com since 2001. He previously published ‘Philosophy at 3:AM: Questions and Answers with 25 Top Philosophers‘. He has interviewed over 300 philosophers for his ongoing series The End Times at 3ammagazine.com. This event is free to attend, please register to confirm your attendance. All talks on the weekend will be taking place in our Philosophy Department located in the Norrington Room, please note this area is only accessible via stairs. For more information about the other events included in the festival please click on the links below. For all enquiries, please email here. 3:00pm – Closing Event. David Edmonds ‘Philosophers take on the World’ with Jeff McMahan on Derek Parfit.